Was pretty happy the lip spoiler was nice and shiny - so I reinstalled the HKS Kansai carbon undercover, only to have it flap at speed when on the expressway and Fuji Speedway. I used some electrical tape to try to fix that problem, but upon removal of the tape, the paint peeled off too! 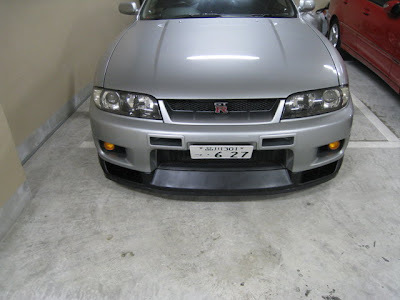 Note the rubber strip underneath - the Nismo add on rubber spoiler, which I had to redo as well. So I had to paint again, this time after removing the paint I used a better primer (one for plastic, not FRP) in order to maintain flex in the paint. I painted with code Toyota 202 black, then covered in a clear flat. I also re-installed the rubber NISMO add on spoiler to the front. Theory was, this spoiler would scrape when the car bottomed out, thus sacrificing itself in place of the plastic lip spoiler. Previously, I found that yes, the spoiler DID give way when scraping, but it also flexed too much - the 6 bolts and the double stick tape was not enough. Because I didn't think that 6 bolts was strong enough, I went out, bought some smaller screws and proceeded to bolt the entire spoiler to the lip spoiler. Unfortunately, there were some ground up portions of the lip spoiler, which I tried to fill in with with black plastic putty. In order to make this not as apparent, I've lined the add-on spoiler with black electrical tape - and it works, too, the tape sacrificing itself when scraping, then the rubber add-on spoiler getting scraped. The end result (PERFECT!) It looks better now than it did when I bought the car! The true test of this repaint job would come the next day, when I took the car to Motegi circuit on June 4 to partipate in the Yamano Handling Course Plus!